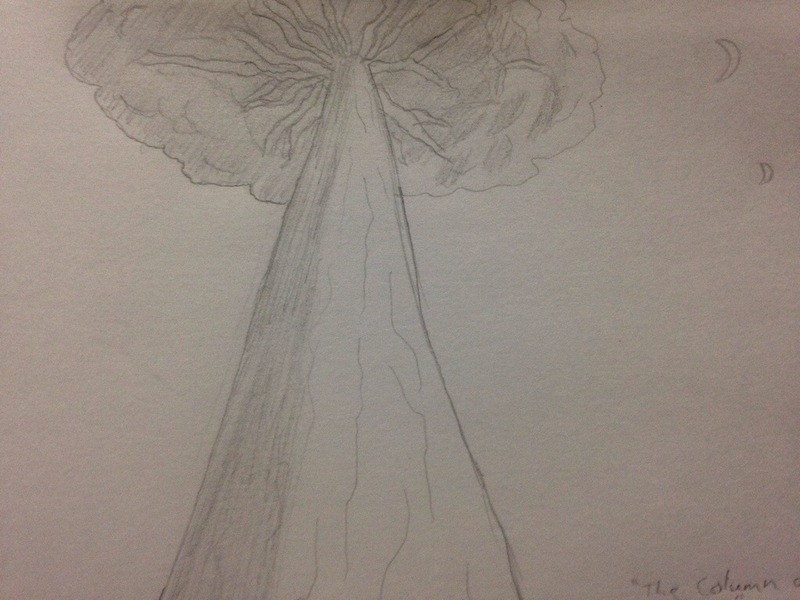 Our budding artist drew something tonight that surprised us. 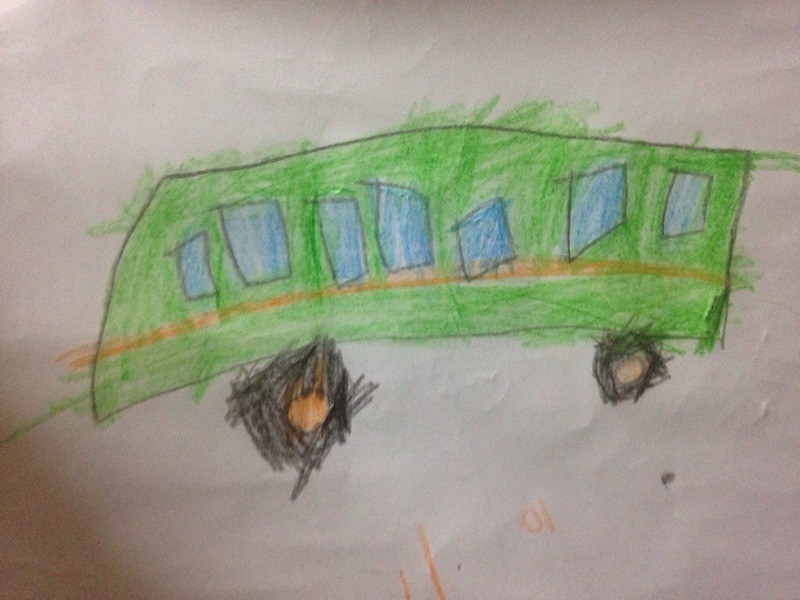 A green bus with an orange stripe. 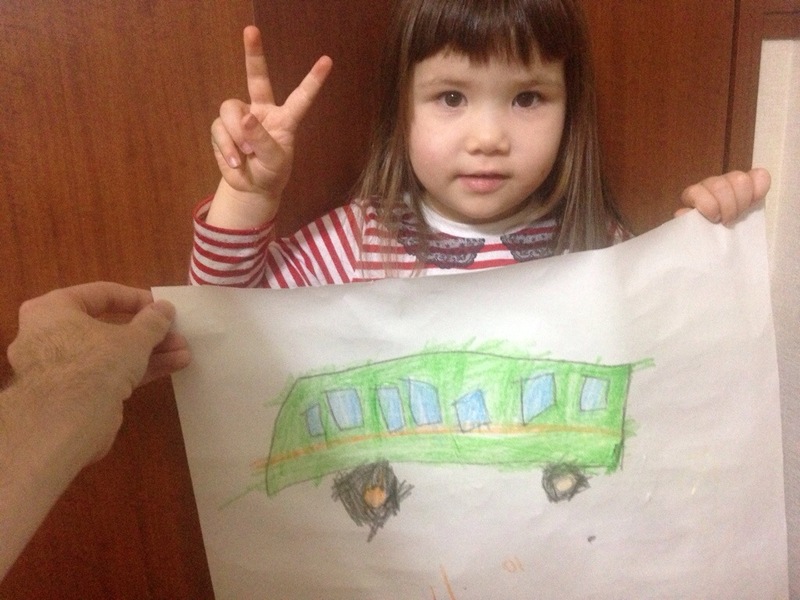 While not a masterpiece, she is only 3 years old. Her colouring is actually quite good. She was actually quite proud of it, and wanted her picture taken with it. 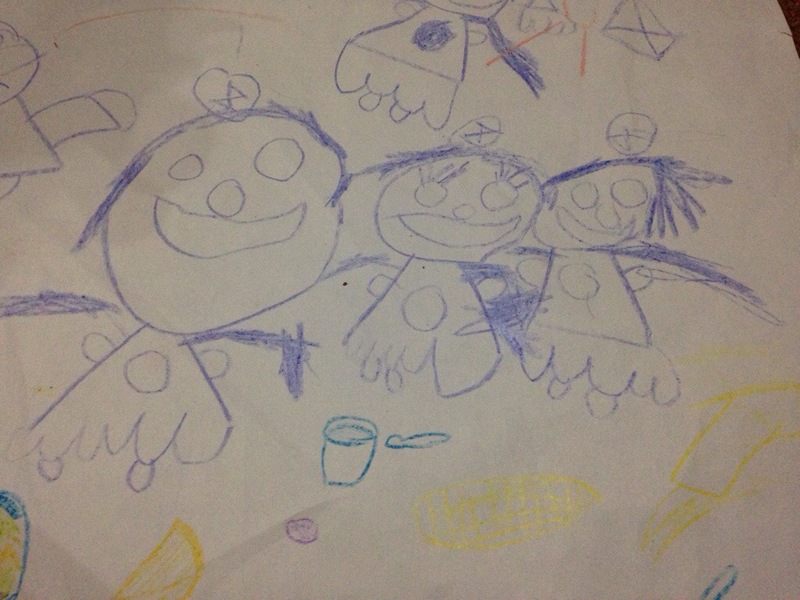 I keep wondering, do three-year-old children normally draw like this? Anyone with children have any idea? Ever have your family portrait done? I have. Here it is. On the left is me. In the middle is my wife. On the right is my daughter. For some reason, we all have bows in our hair and wearing skirts. I asked my daughter about the bow in my hair and she said it was cute. So, she wants me to have a bow in my hair. 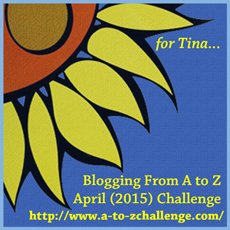 I’ve decided to do a little something extra for the A to Z Challenge. As I said before, I’ll be writing short flash fiction each day. The stories will be based on Ariadne, but will feature a person whose job starts with each letter of the alphabet. The stories could be only 100 words long, or maybe even up to 500. It really depends on what the character and scene, as well as time constraints. The extra thing I want to do is to draw a quick sketch related to the scene. It’ll be posted along with the story each day. They most likely won’t feature the character, but part of the location. It could be something they see or use. This should be interesting. Watching my daughter’s budding artistic abilities and seeing other art makes me want to draw. 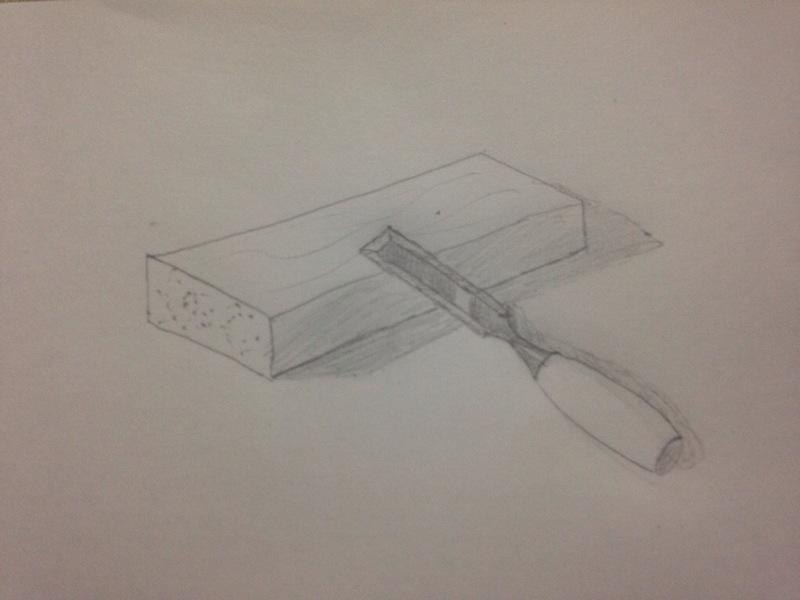 In school, I used to draw a lot. I took art class until grade 10 in high school, and at that time, I’d done a fairly detailed drawing of my shoe. That was actually one of our art projects, to draw our shoes. We only had an hour to do it, too. Mine turned out great, though I don’t know if we still have the picture. 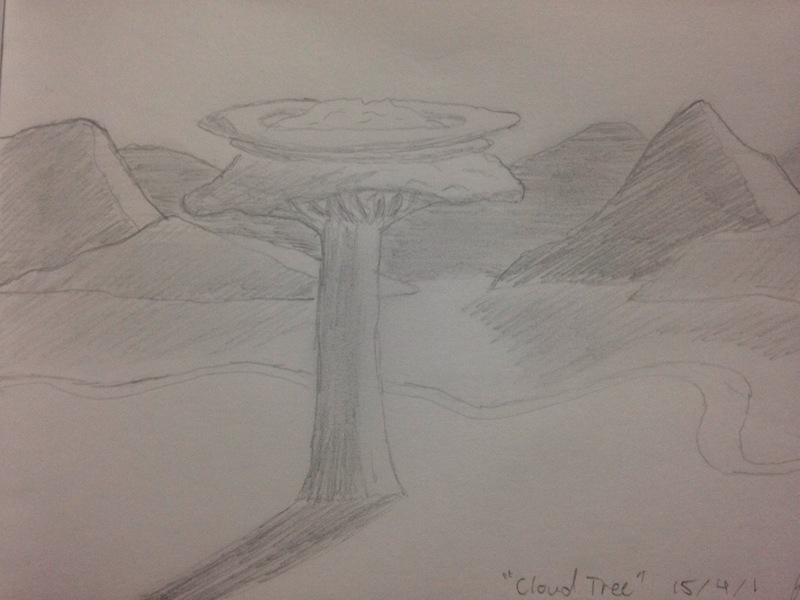 I prefer drawing scenery, buildings, animals, and still life. I don’t do portraits. They always appear lifeless and rather scary. The problem is with the eyes. Everything else I can do well. For Ariadne, I’m going to be drawing various examples of scenery, concept art for spacecraft, vehicles, buildings, plants, and animals. They’ll mainly just be pencil drawings, as that’s what I’m most comfortable with. Maps, though, will be done in pencil first, then drawn over on my computer. Anyway, I was so excited to draw, I did this picture. See? I’m terrible at portraits. I’m just joking. I’ll definitely be doing it on paper. It’s not easy drawing with a laptop’s track pad. I’m rather hesitant to say this kind of thing, but going through several child care websites (official ones, not ones made by average people), I think we have to make the choice whether to get our daughter tested. As she’s learning two languages at once, it’s difficult to determine if she’s great with language. She speaks mostly Japanese, and she’s getting fairly conversational at 3 years and 2 months old. I’m not sure if she’s learning at a normal rate, as she’s also learning English. She knows a lot of words in English, and occasionally speaks English. She understands what I say to her, but she always responds in Japanese. Of course, this is quite normal, as it’s what she hears and uses more often than not. It’s really only with me and sometimes with my wife that she’s using English. But we shouldn’t worry about her English ability, as it’ll catch up quickly by 5 years old. However, when we observe her drawing ability, we are amazed. I’d checked what kids her age should be drawing. She should be drawing faces with a circle and two dots for eyes. Then there may be arms and legs growing out of the head like sticks. That’s all. 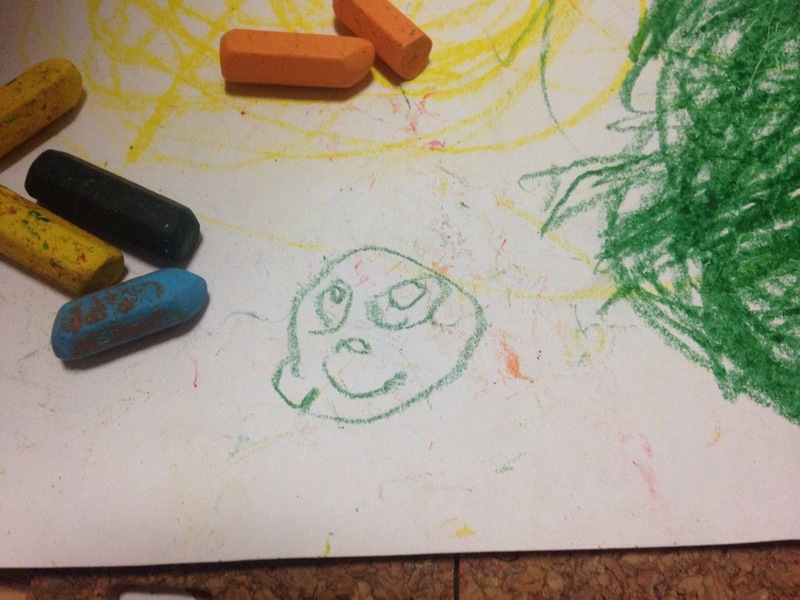 The first face she drew when she was still 2 years old had circles for eyes with circles for pupils. It also had a nose and a smiling mouth. My daughter’s first face when she was 2 years, 11 months old. But since that time, it’s evolved into faces with winking eyes, eyelashes, hair, ears, full bodies, legs, and arms with hands that have fingers. She’s quite detailed. 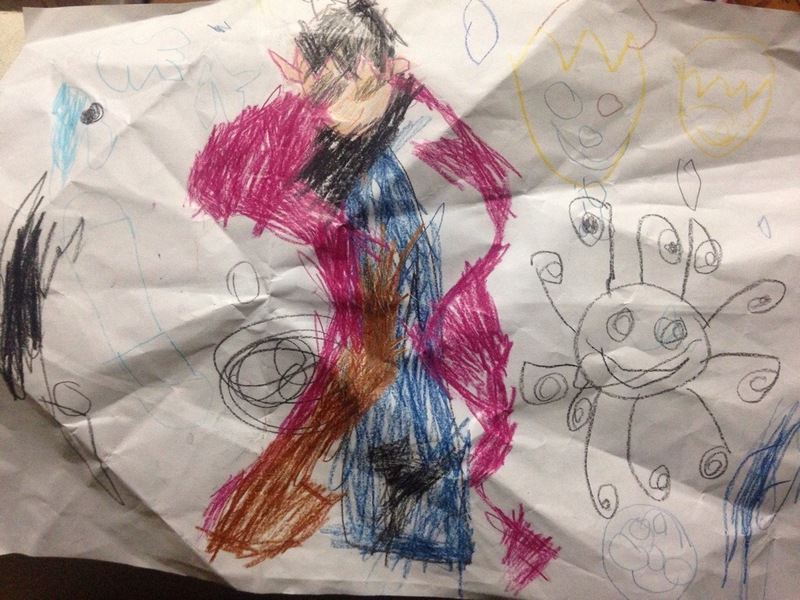 She’s drawn her favourite characters with surprising accuracy for a child her age. Drawn this week at 3 years, 2 months old. This is Disney’s Sofia the First. I checked what age her drawing ability represents. It seems like anyone who saw her drawings would think she’s 4 or 5 years old. She is obsessed with drawing. Our home is filled with large pieces of paper with her artwork. She goes through several sheets of paper every day. It’s not just art she loves. She also has an interest in dancing, singing, and music. She has a big artistic side. On top of that, she loves building things with Lego. When she makes something, she usually uses symmetry, and once made the starship Enterprise without knowing what it is. She even tries yoga poses and has good balance. As for writing, she can write her name in both English and Japanese. But the unusual thing is that she writes each letter from the top right instead of the top left. It’s kind of how a left-handed child might write a letter, but she uses her right hand. Not sure what’s going on there. So, we have some things to think about. Do we get her tested? Is she gifted or merely just ahead of her peers?